The Central Bank will roll out the new Rwf500 and Rwf1,000 notes next week. This follows a Presidential Order issuing new banknotes as legal tender. The new notes will cost the government Rwf1.6 billion annually for the next three years, according to Central Bank Governor John Rwangombwa. The notes have improved security features as well as better quality to reduce wearing out as was the case with the previous Rwf500 note. 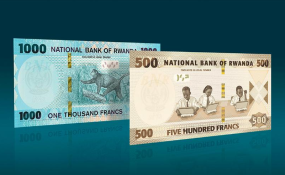 The Rwf500 note will henceforth be brown in colour from the current blue while the Rwf1,000 will remain the same colour-blue. The new notes also have an improved design to distinguish between the two notes which was mentioned as a challenge by users previously. The two notes also bear Rwandan cultural insignia.